One of the easiest ways to decorate in the flavor of the Swedish style is through the use of fabrics. 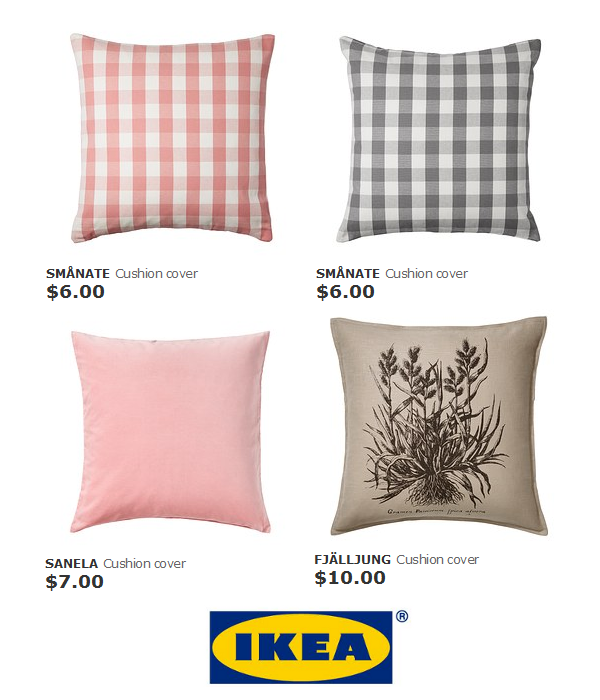 My husband and I took a trip up to Canada a few weeks ago, and I had the chance to visit one of my favorite stores, Ikea. 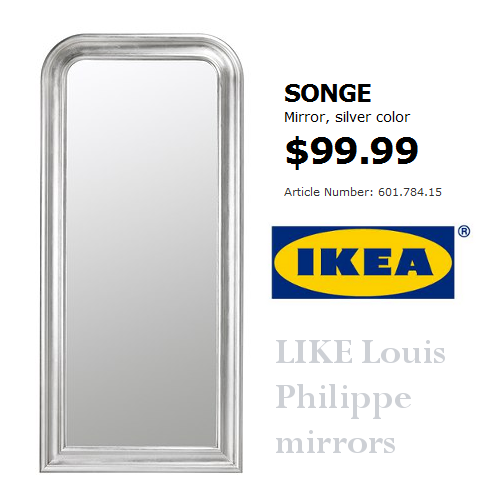 We got to Ikea around 7pm, so we didn’t have a lot of time to shop before the store closed up. 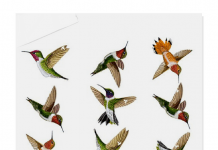 I missed a few items on my list, but thankfully, most of their new and old collections are available on ebay. 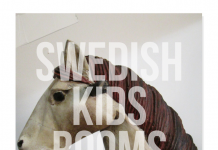 In my early 20’s I had the chance to work at Ikea as a short term job though the summer, and I loved it. 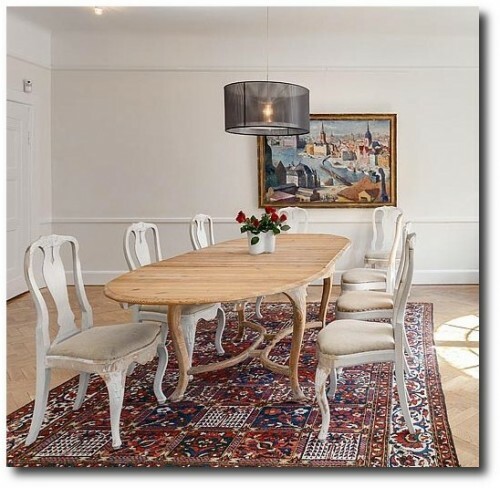 When I go to Ikea, I tend to look for the classic accessories that would fit into a home designed around the antique styles. 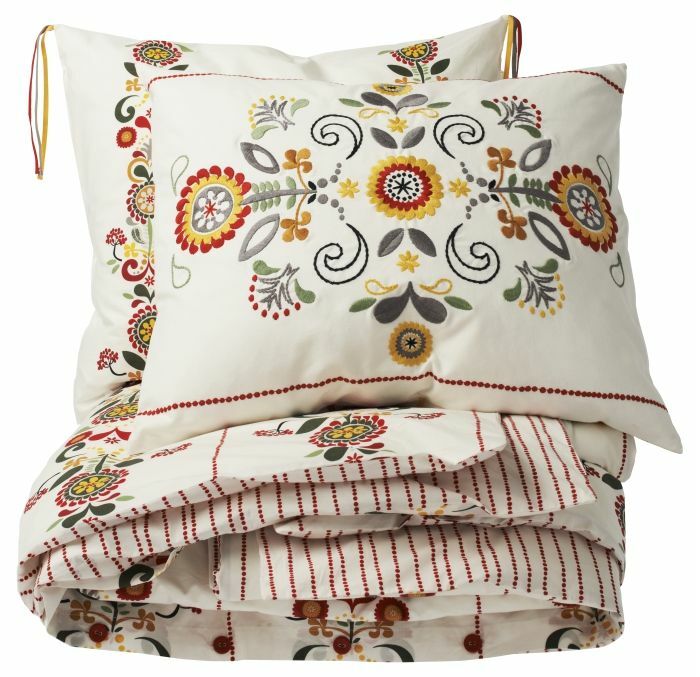 Their linens, wood mirrors, bowls, glass accessories, and throw rugs are the best products at Ikea. 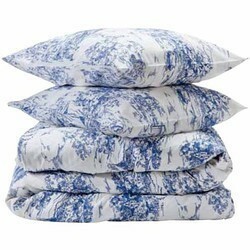 Their drapery, bedsheets, comforters, and pillows are always great buys. 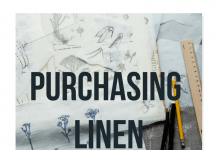 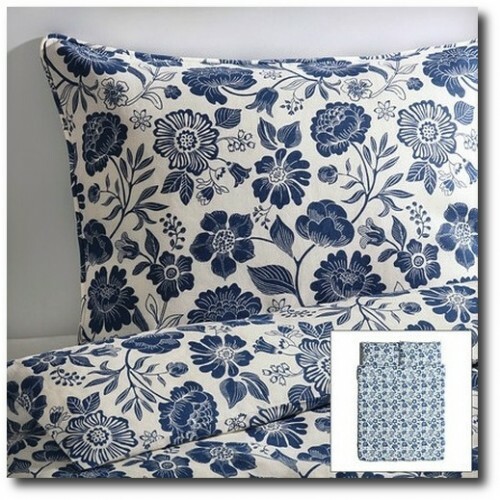 They have wonderful selection of pillow covers from year to year, which allow you to exchange out patterns in your home without having to sew, cut and assemble it yourself. 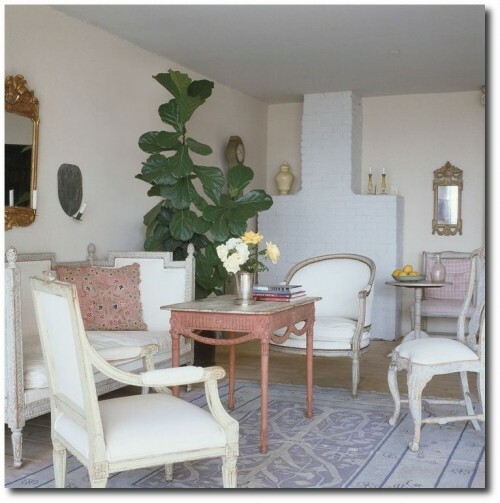 Adding florals in your home is one way to bring the garden inside. 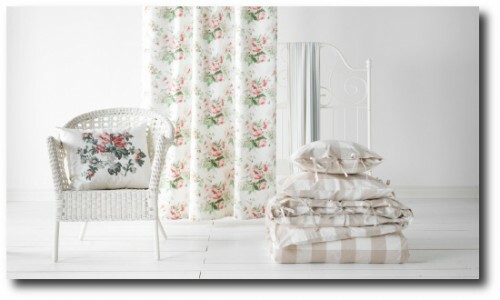 Ikea often keeps their florals and stripe fabric from year to year, giving you a really classic pattern to work with for your Swedish inspired interior. 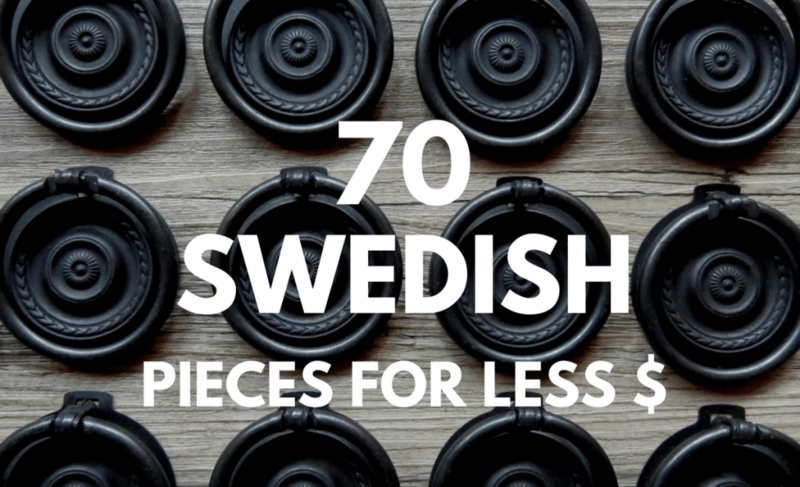 They also have a friendly mix of new updated modern looks that fit into the Swedish styled looks as well. 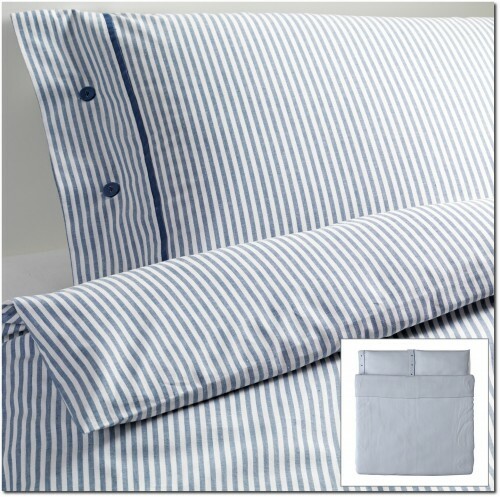 If you are looking to update your bedroom for the summer, buy a duvet set. 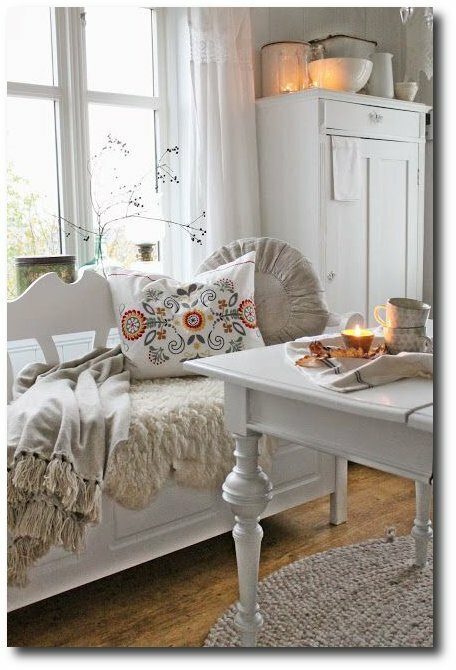 If you can handle a sewing machine, buy a second set of the same pattern and add make slipcovers for your chairs or lamp shades. 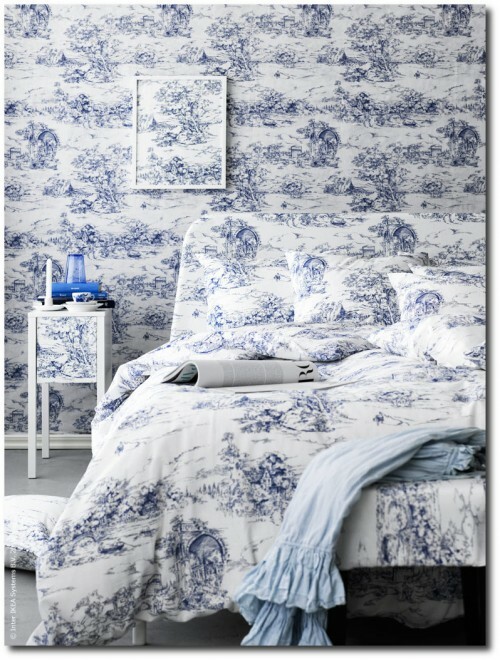 You could have a summer and winter look for your bedroom without spending a ton of money. 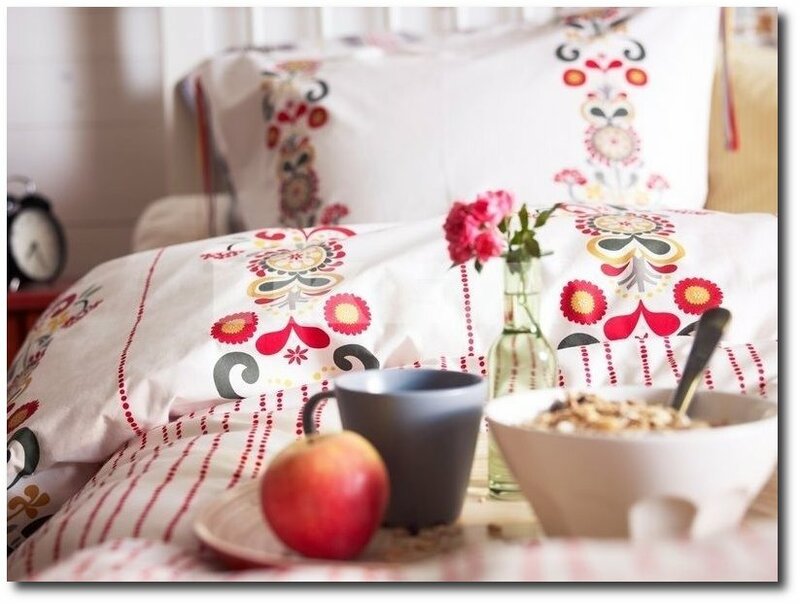 In the book “In Bringing It Home – Sweden” Author Cheryl MacLachlan gives us some really easy tips for pulling together the Swedish look in your bedroom. 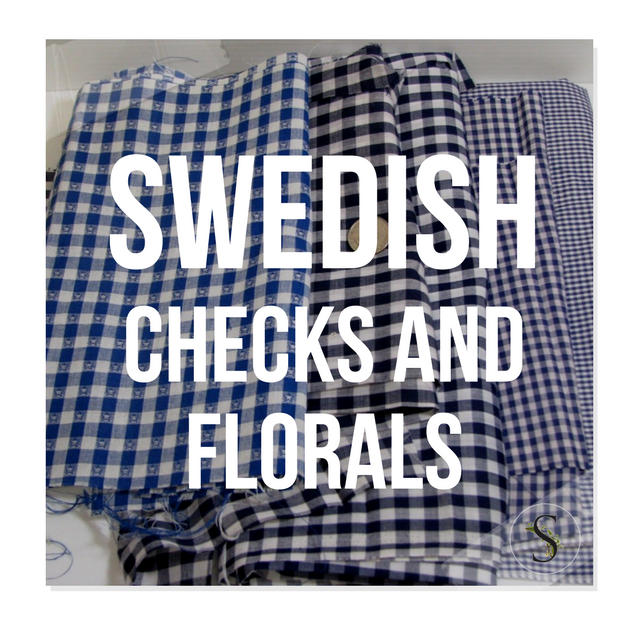 – She says that the classic Swedish fabrics belong to three families: Stripes, Checks and Motifs inspired by nature. 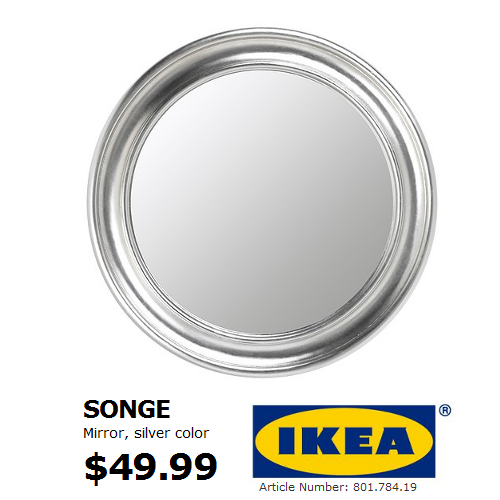 You cannot go wrong with any of these three choices. 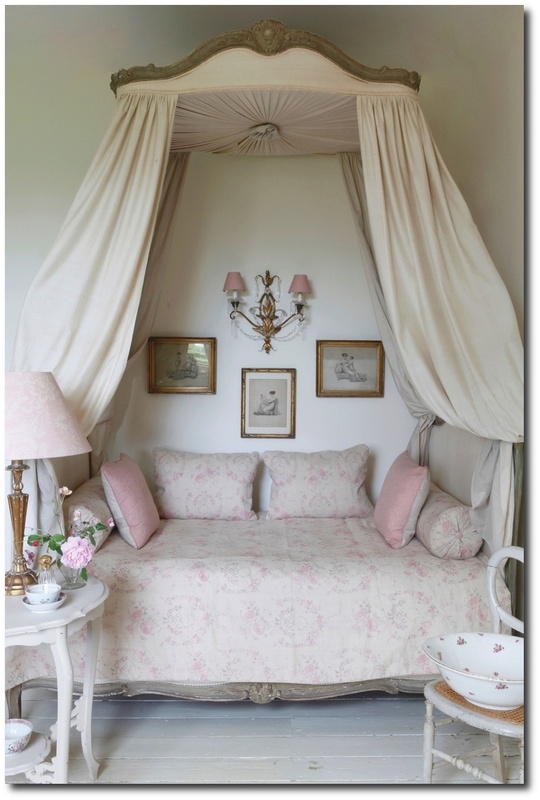 – In the finest homes, the bedrooms were fitted with hand carved poster beds or gracious carved bed-crowns. 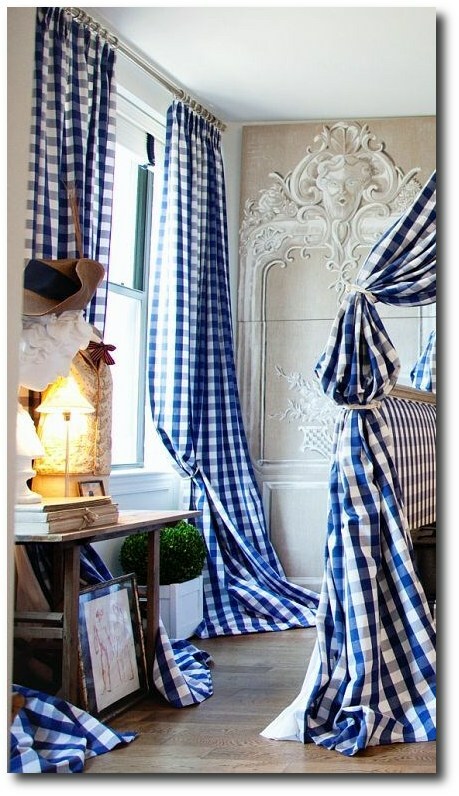 Consider buying a canopy bed, or replicate the look by hanging drapery from the ceiling using rod holders made for the ceiling. – If you prefer the 17th and 18th century romantic bed looks, consider making your own bed crown out of wood, upholstering it, and attaching it to the wall. 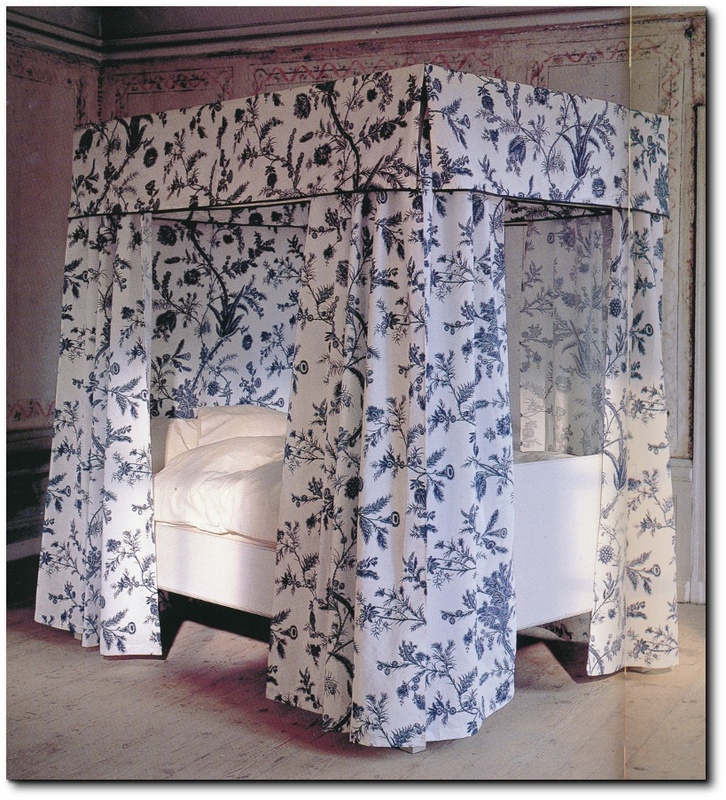 Match your bed linens to the fabric draperies hung from the crown to create a dramatic look for your bedroom. – Swedish beds were distinguished by the treatment of the wood frame. The bed frames were usually carved and painted in a pale gray, or an “English red” the name for a reddish brown color. 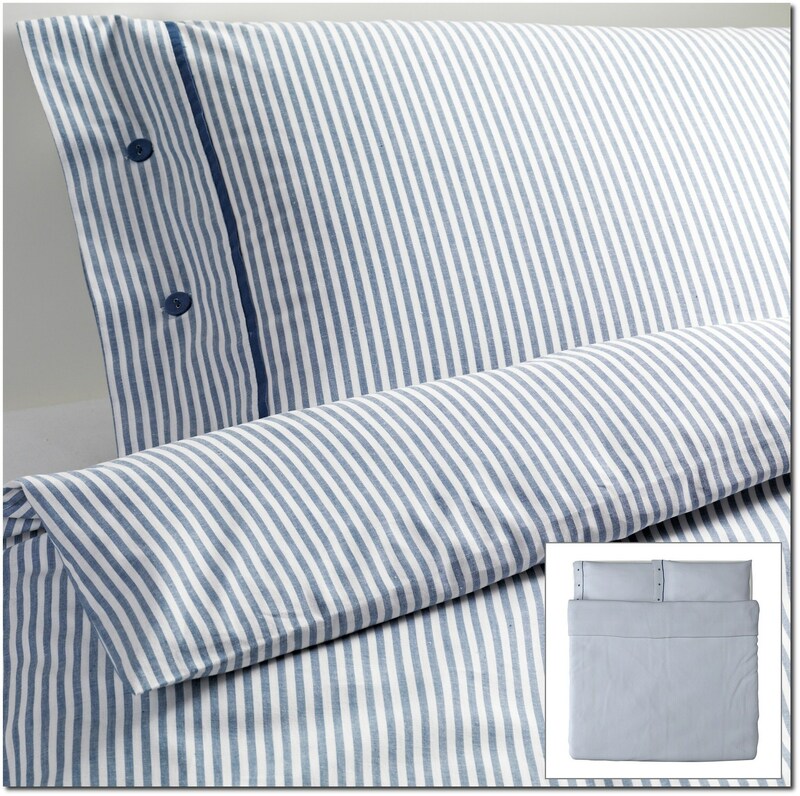 – Select bed linens in pale shades of soft sky blues, pale yellows and grays. -If you have an antique wood bed, consider sanding it down to it’s raw pine state. Raw pine wood is beautiful without paint. 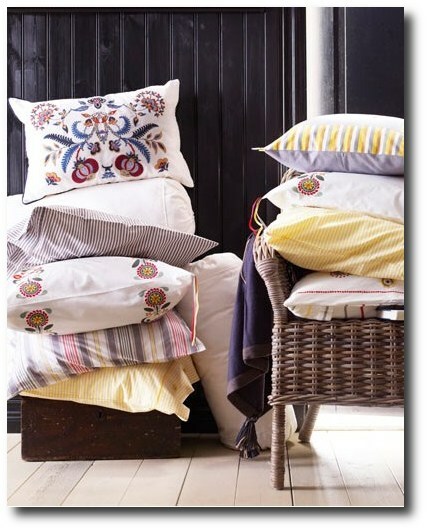 -A very easy way to update your living room for the spring and summer season is to purchase throw pillows. 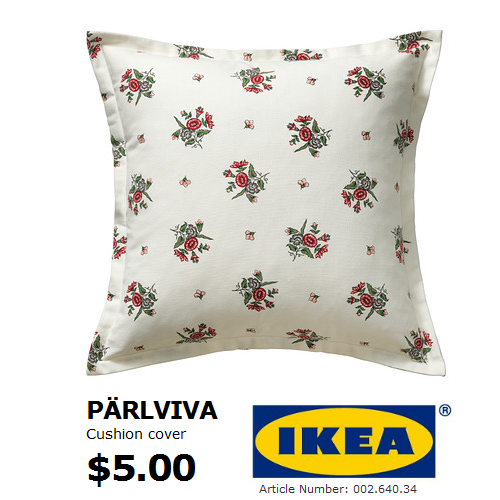 Ikea has throw pillow covers for as little as 7 dollars. 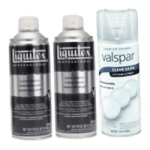 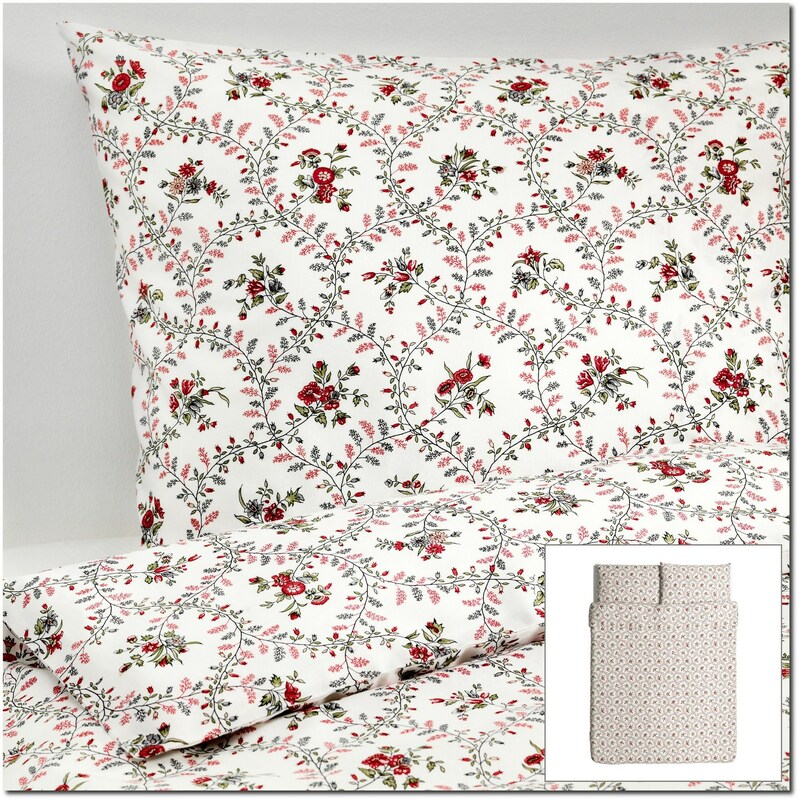 – Exchange out the heavier blankets used in the winter for lighter throws. 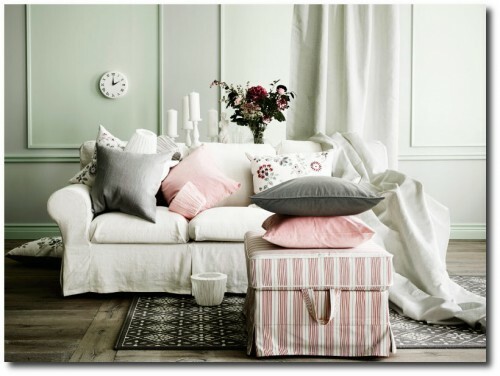 Go for color, and pattern on your sofa. – Don’t be afraid of colors such as pink and light blue. 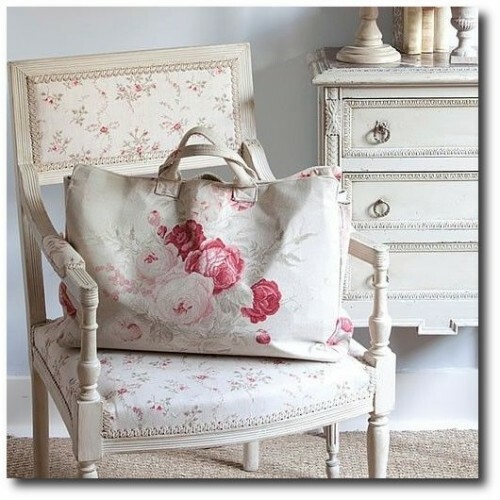 Pink can be pretty on a chair, or consider a print on the wall in the color tones of pink and green. 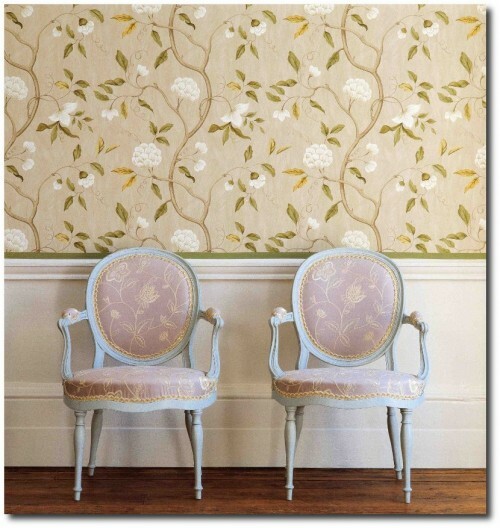 Botanical prints featuring flowers can be a nice way of updating your walls in the summer. 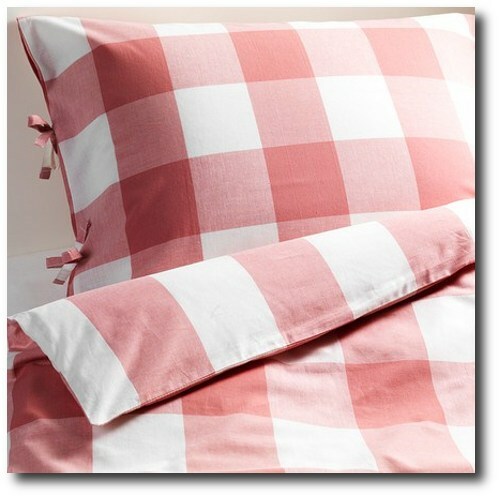 Go for a pretty pink slipcover, or bed linens. 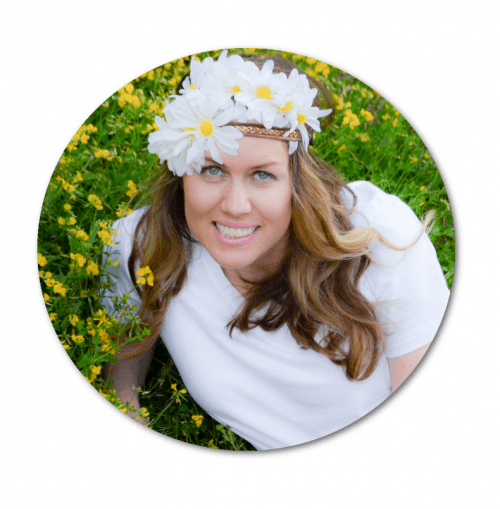 – A nice floral centerpiece can be really captivating for the summer. 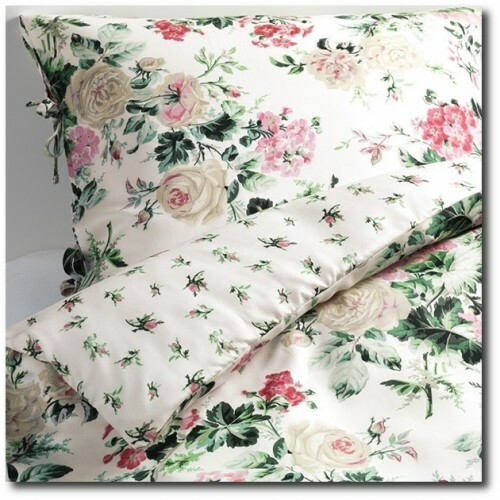 I am always surprised at the quality of the florals at Michael’s crafts. 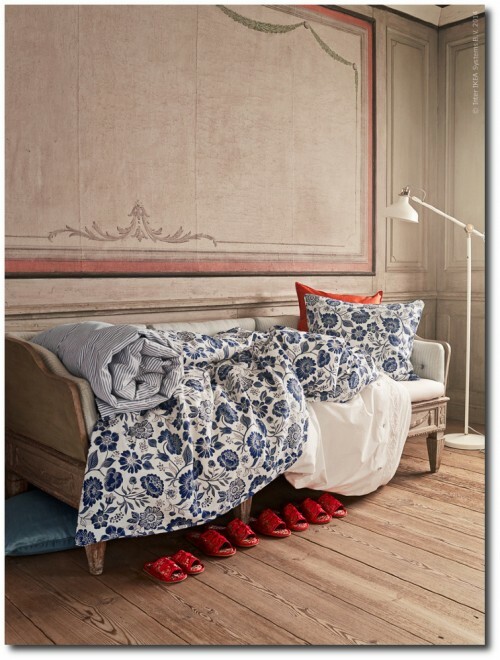 Go for a large floral mix, in the colors you dream about, and build your room around it. 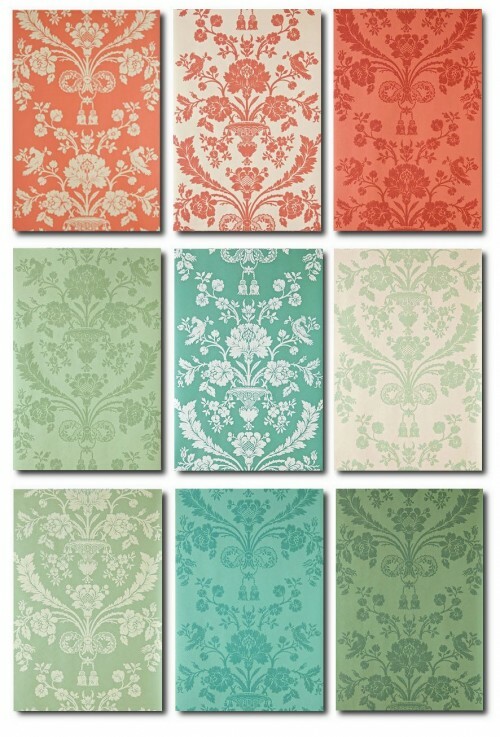 – Pick up a set of summer dinner plates. 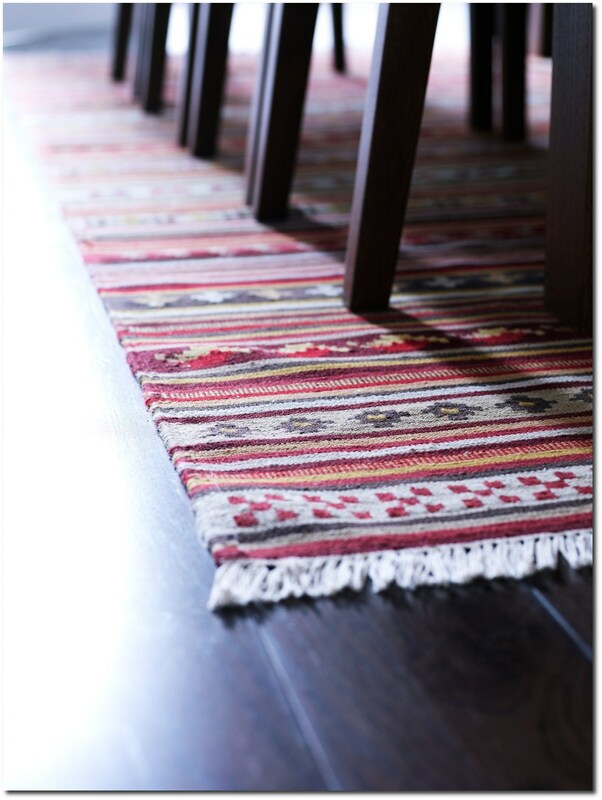 Adding some color to your table can really lift the spirit. 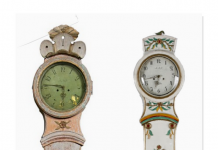 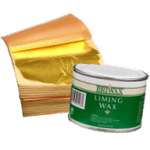 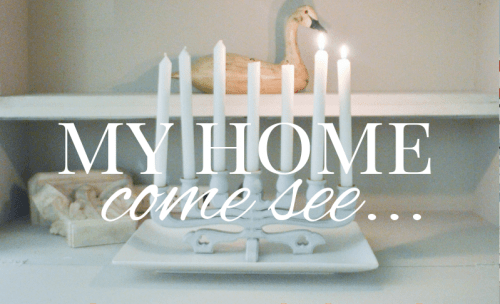 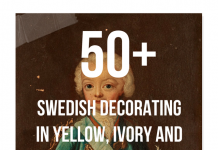 – Go flea market shopping and pick up something really bright for your interior. 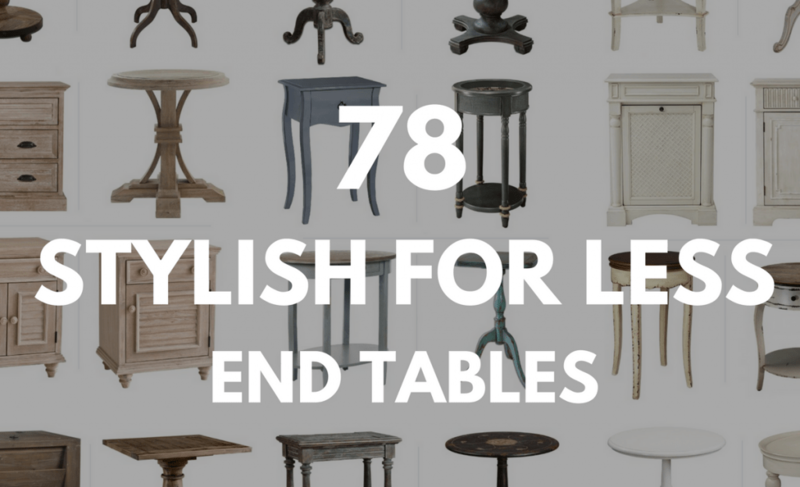 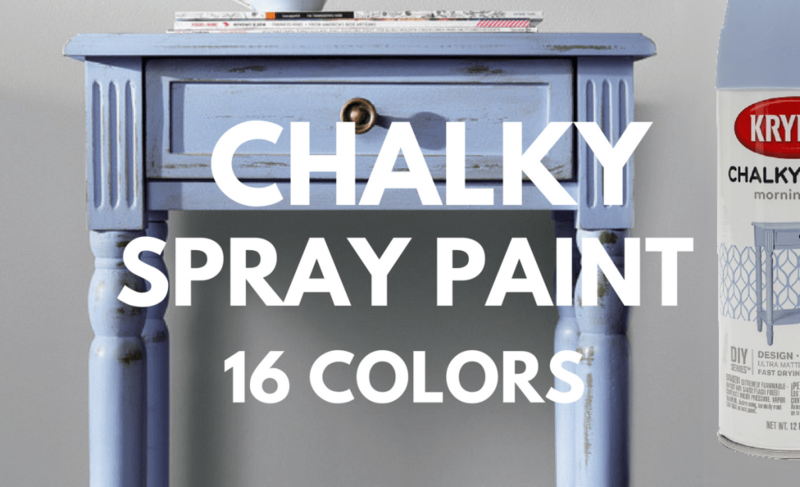 Consider painting a side table, or a wood accessory. 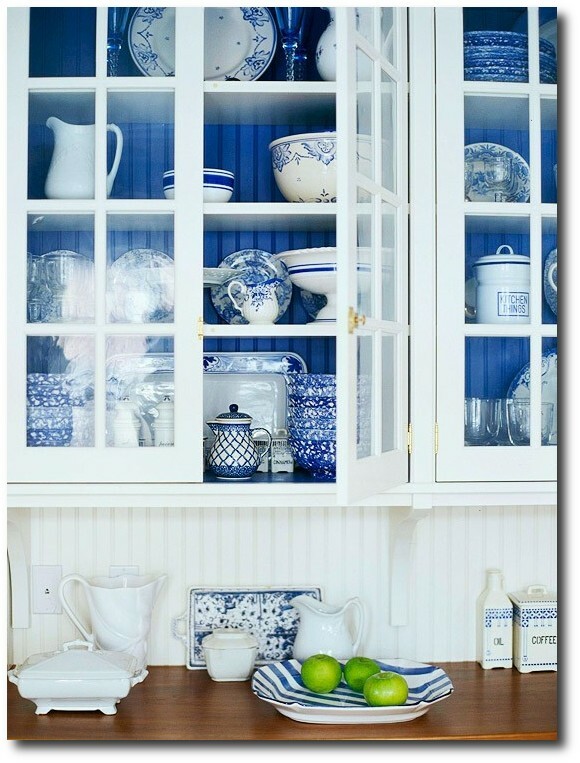 A pop of color can go a long way. 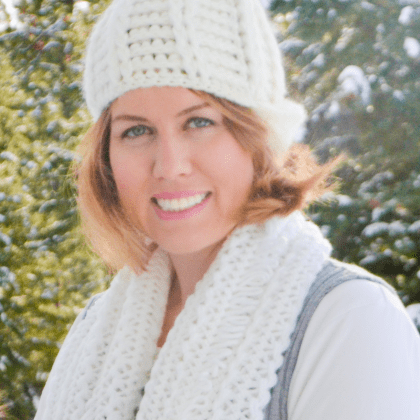 Go for something that really is fun, and exciting! Another look at this room from Cheryl’s book…..
Finding heavy weight blue and white fabric for upholstery can be difficult. 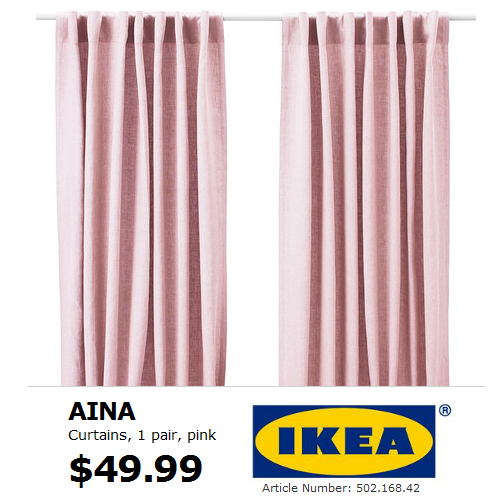 After shopping at some of the largest fabric stores, I have found Ikea to have some of the best heavy weight fabrics at reasonable price points. 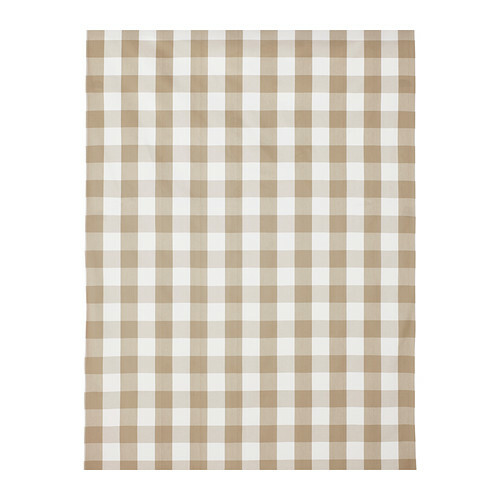 After ordering several check prints on ebay and amazon, I found the number one problem, is the size of the box print to be very small, or 2, the fabric is so paper thin, that it would be difficult to upholster with. 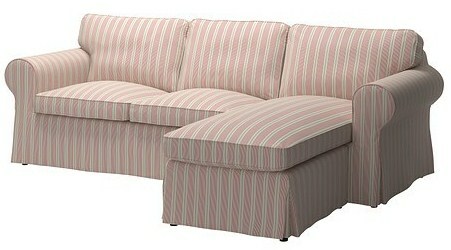 Ikea’s fabric section is limited, I find their fabrics are heavier, and cost less than most fabric stores. 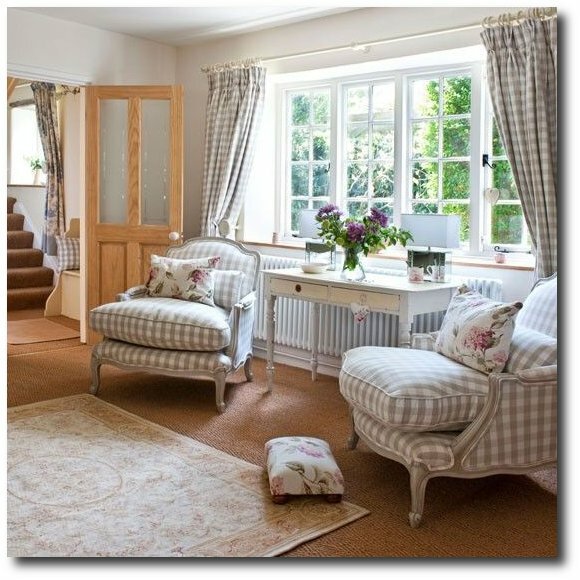 I have used the Berta Ruta pattern in my home for my upholstered pieces. 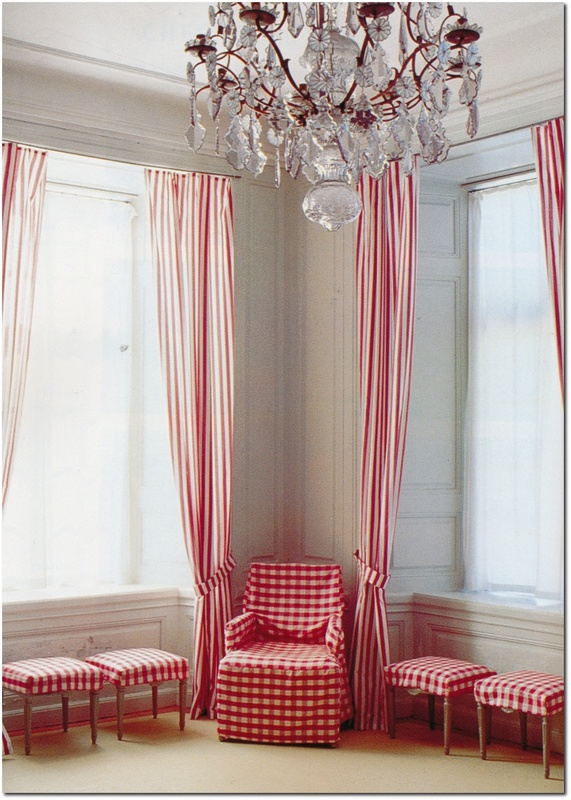 Use some of their lighter fabrics for making slipcovers. 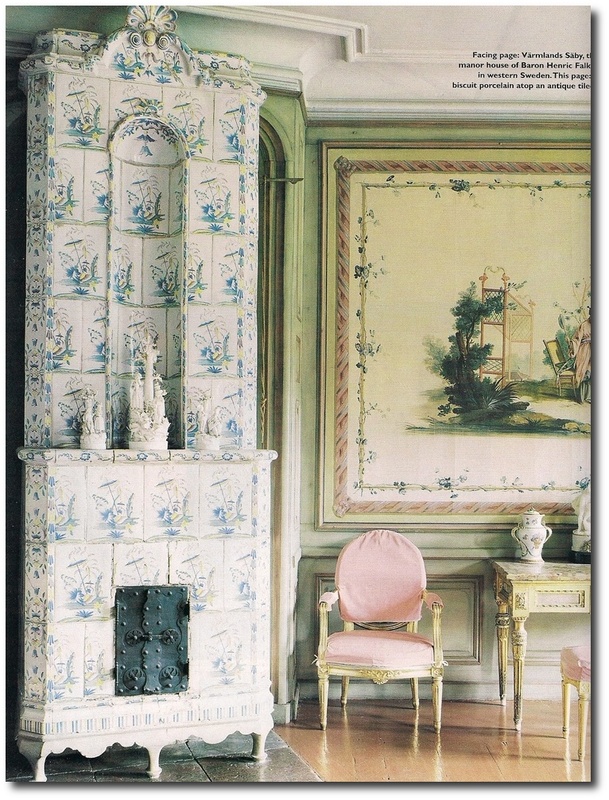 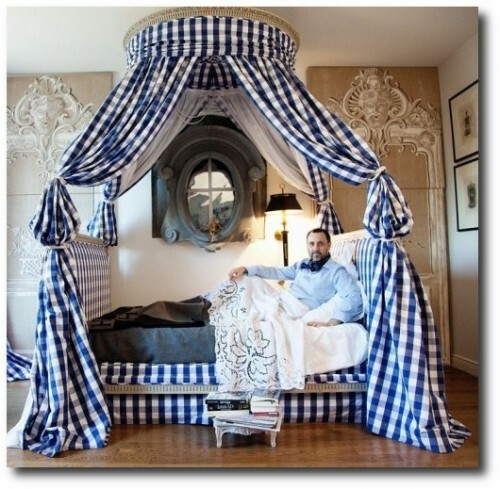 Herve’s bedroom shows off a spectacular Louis XVI Lit de polonaise bed with blue and white fabrics that are used for the bed skirts, bed drapery, and wall curtains. 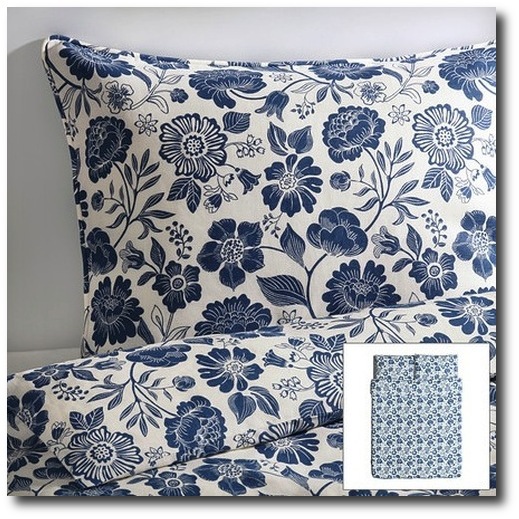 The Emmie Blom duvet cover and pillow case set sells for $49. 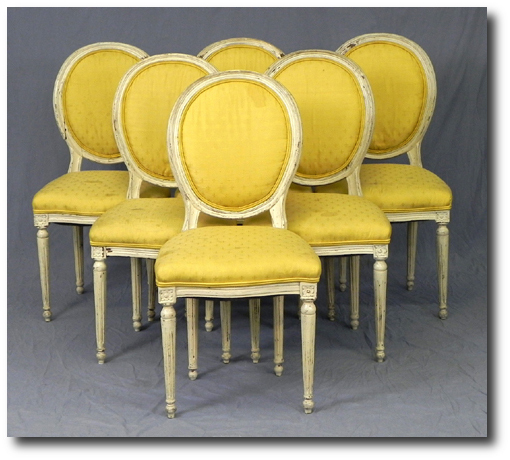 Buy another set to make slipcovers for a pair of chairs. The set comes with two prints. Simply flip the duvet cover over for a smaller rose print. The best thing about this print is the white background. The white gives the print a fresh spring and summer feel. 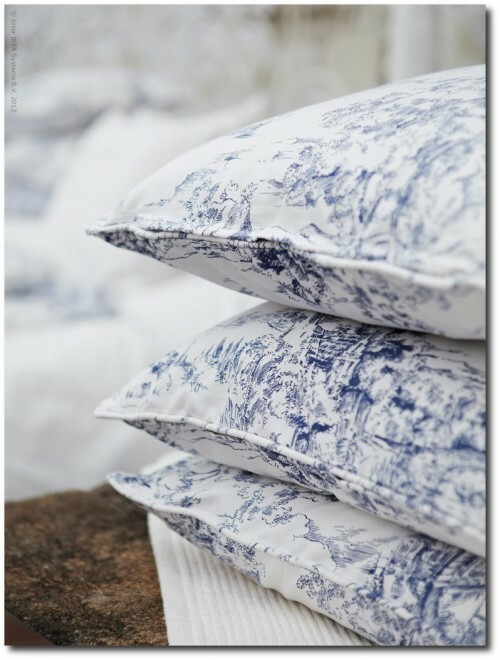 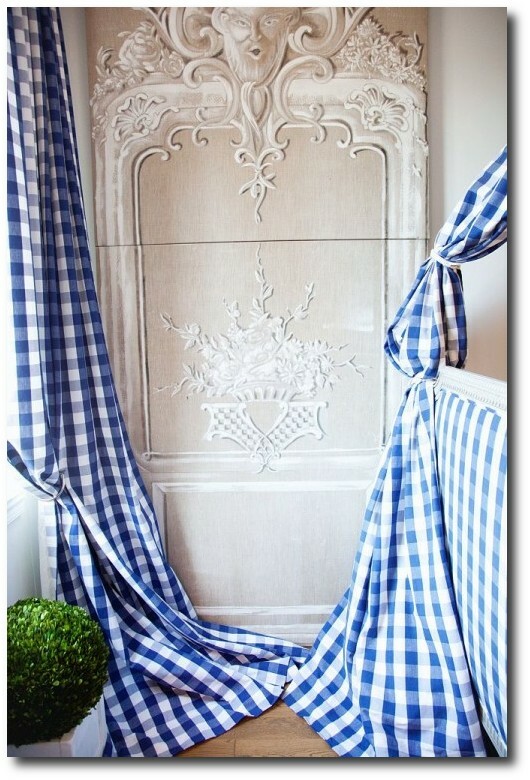 Toile is a very popular French choice for bed linens, drapery, and upholstery. 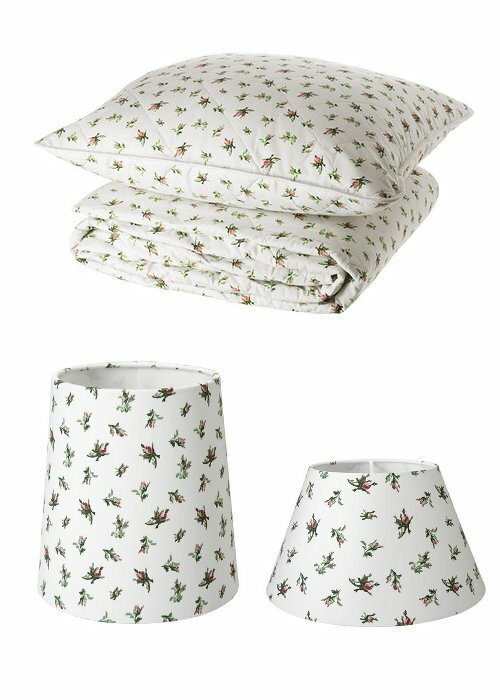 Buy the duvet cover and pillow set from Ikea in Queen for only $20 dollars, and a King set for $29. 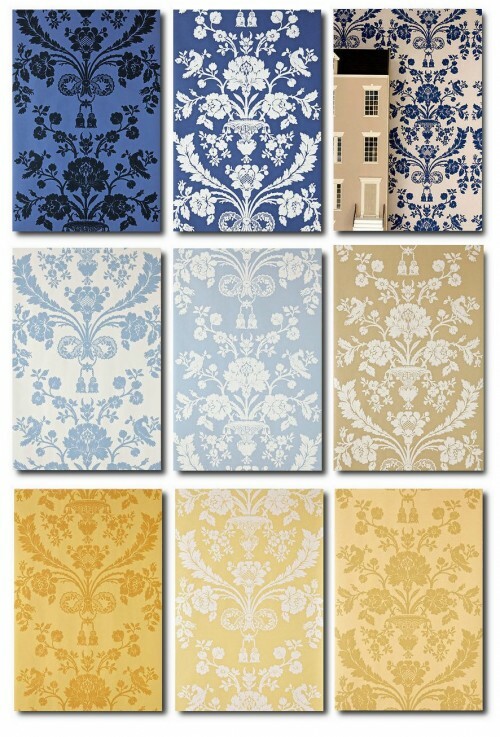 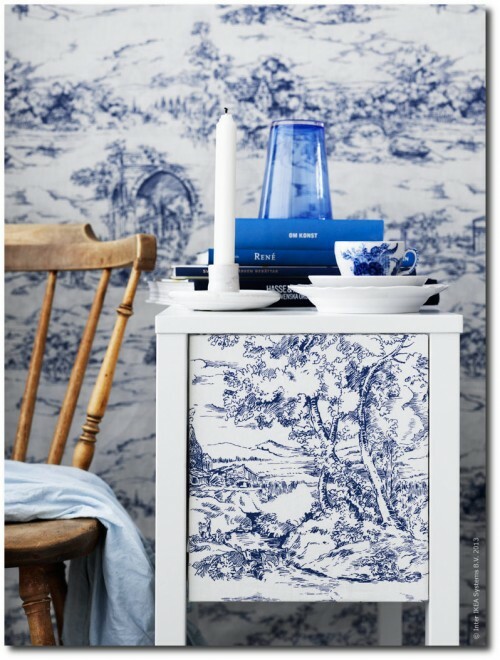 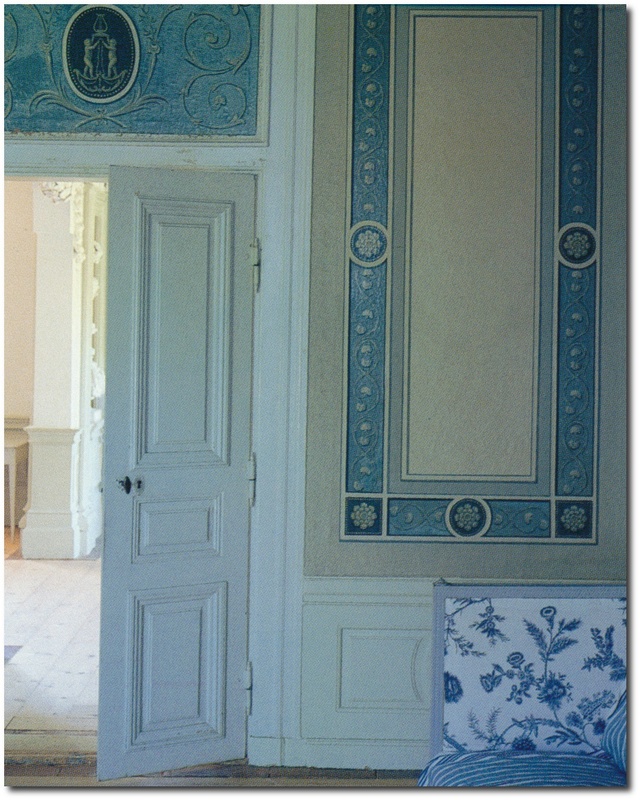 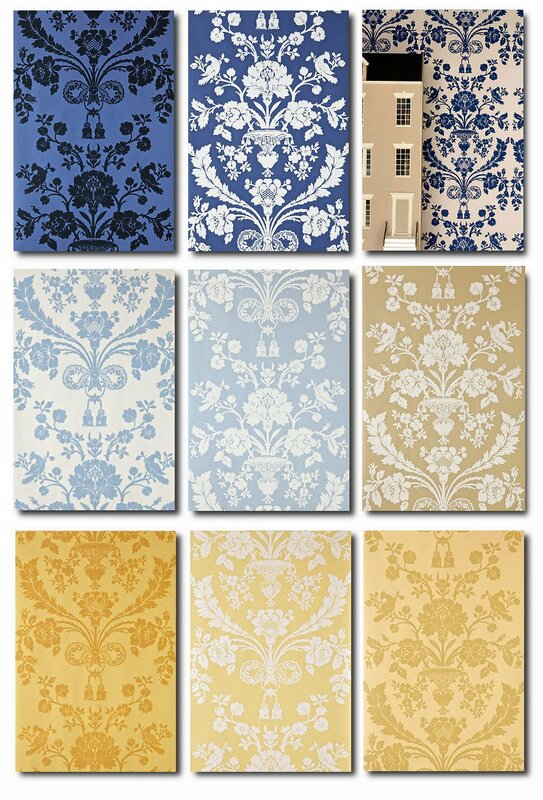 Collect blue and white transferware for your walls instead of hanging wallpaper. 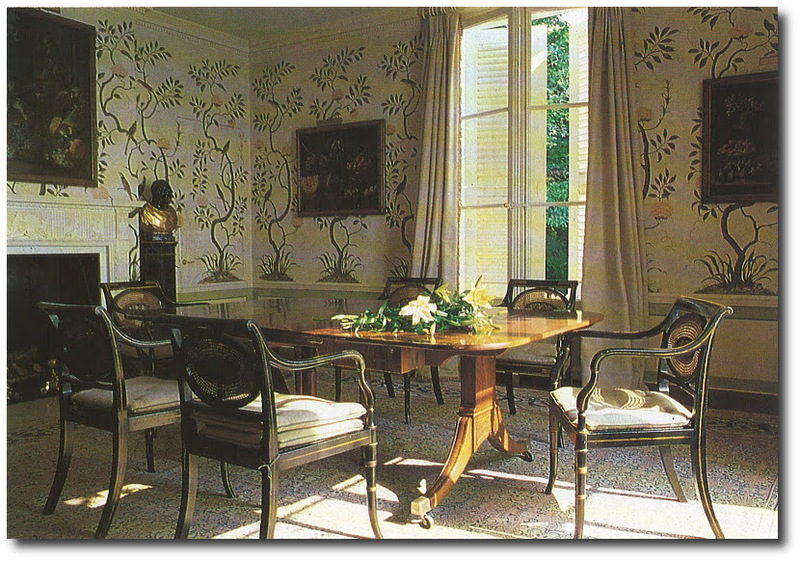 Add in a antique wood chair which is not painted to offset the detailed pattern. 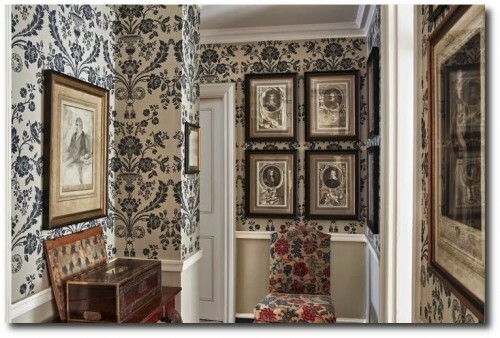 I have looked at this print in person, and have to say it is impressive. 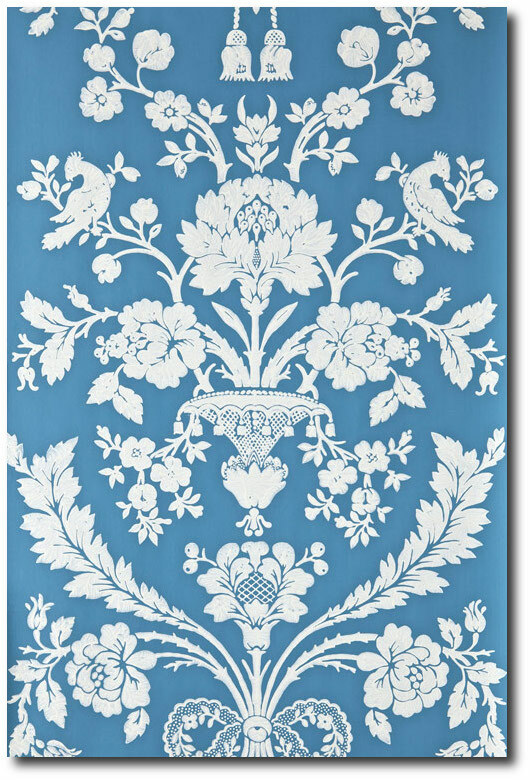 The scale of the print is larger, and the white background makes this fabric bright and light in appearance. 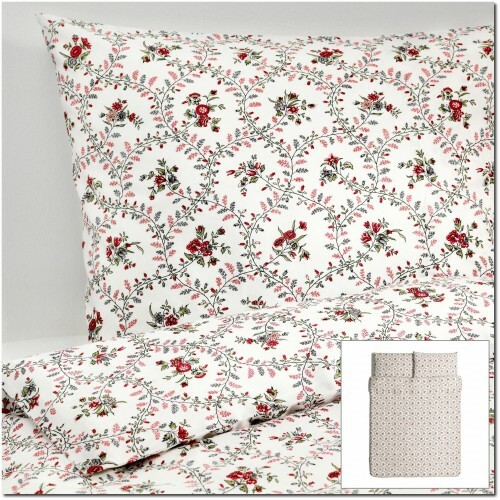 The Queen sells for $79 which includes a duvet cover and pillow cases, and the king sells for $89. 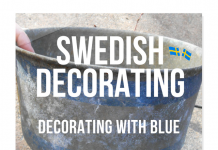 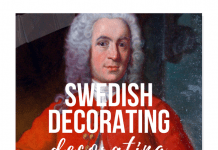 In Bringing It Home – Sweden, Cheryl MacLachlan reveals the secrets of Swedish decorating and entertaining and explains how to capture those charms anywhere. 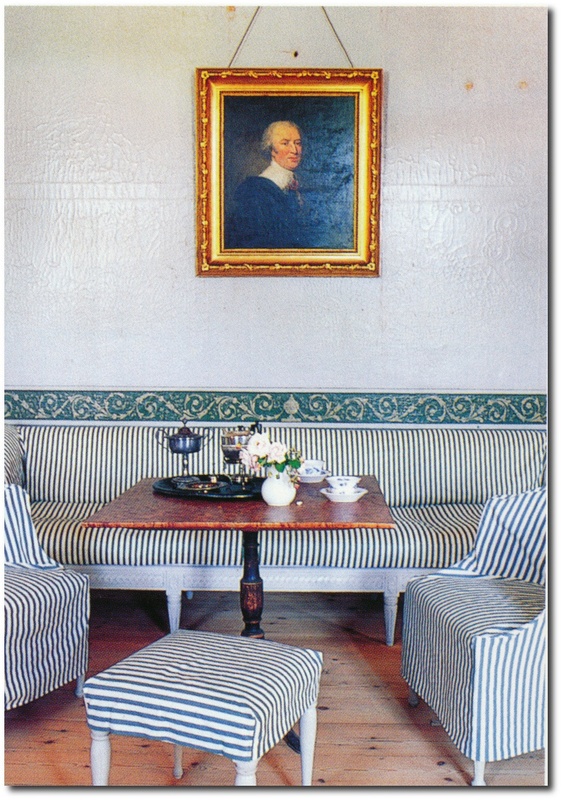 After spending much time visiting homes and conversing with families in towns and cities throughout Sweden, she became familiar with the subtle but unmistakable qualities of Swedish life: how furniture is chosen for its pure, fine lines; how simple fabrics are used to great effect; how soft, delicate colors are layered to create rooms full of light and elegance. 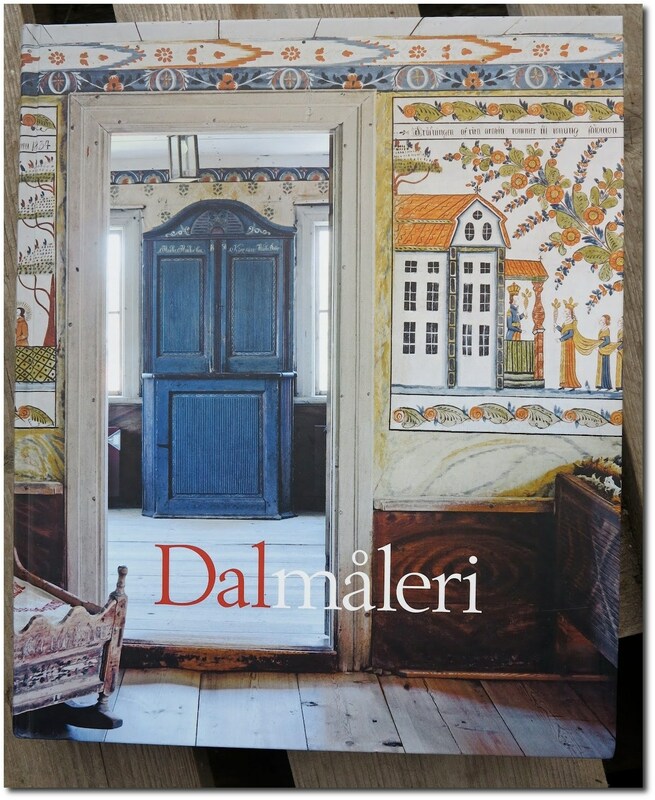 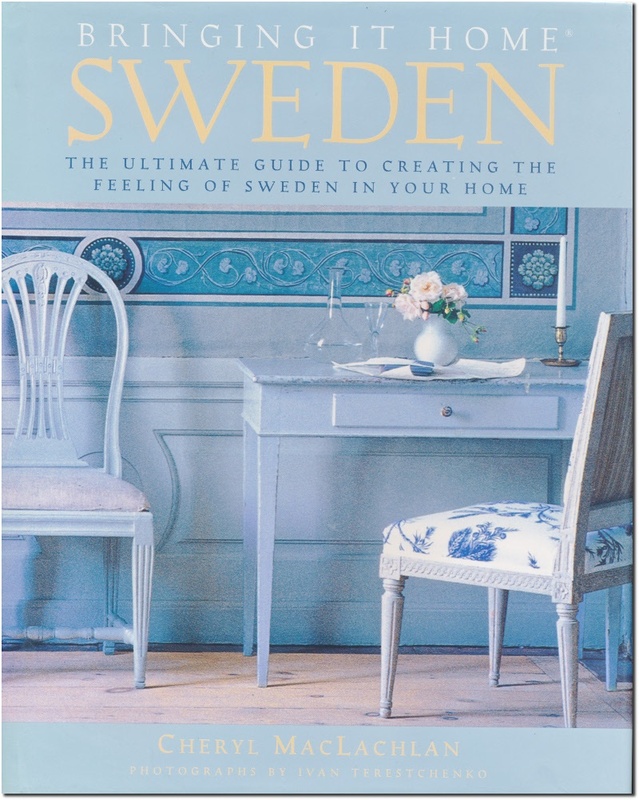 Now in this book, she offers the essence of Swedish style, with an abundance of practical information, handy how-to projects, and colorful inspiration to enrich any home. From the finer points of Gustavian furniture (now available in reproduction everywhere) to the exquisite choices offered by Swedish crystal, from the secret to buying the perfect down comforter to the ultimate recipe for Swedish meatballs, the best of Sweden is shared with readers. 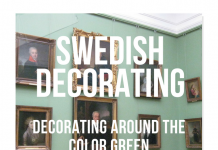 Richly illustrated with more than two hundred color photographs by Ivan Terestchenko. Don’t you love the color? 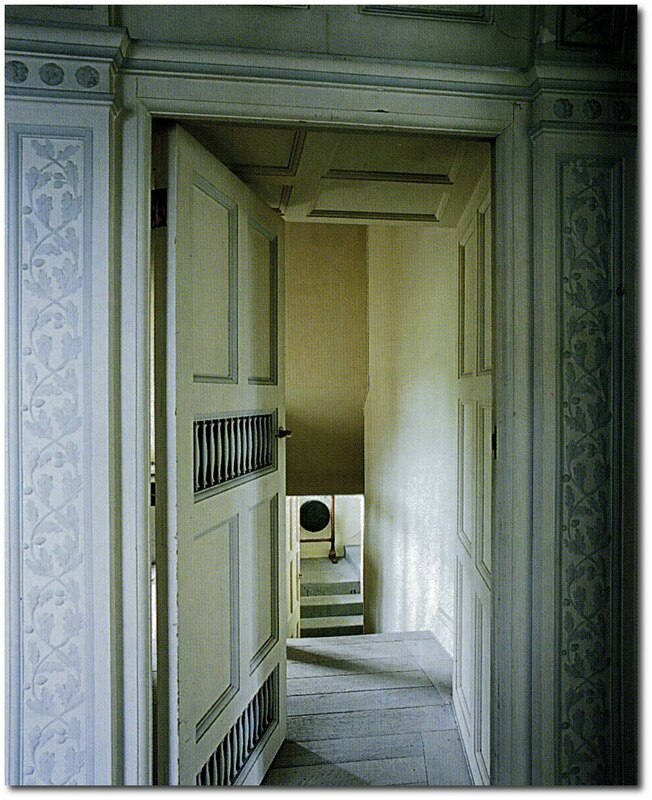 The Princess’s Apartments were fitted out at the beginning of the 1780s for Gustav III’s younger sister Sofia Albertina. 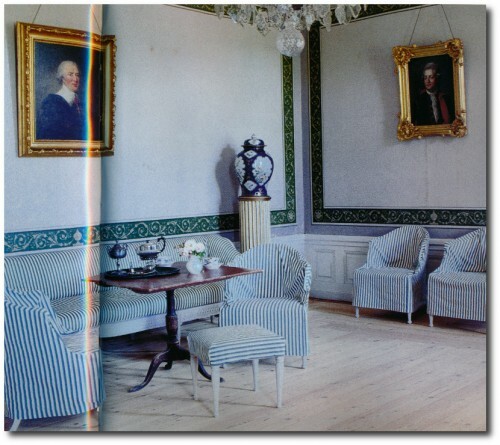 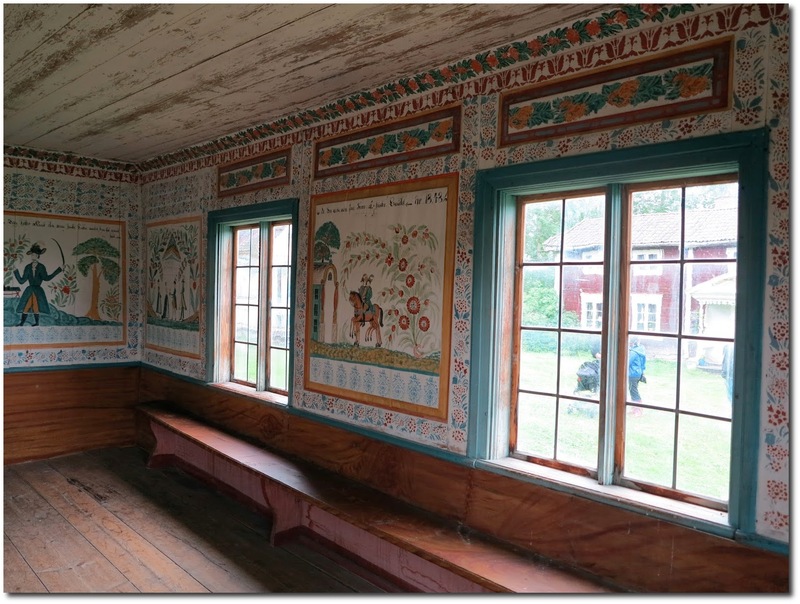 At the end of the 17th century these apartments were lived in by Crown Prince Karl, who later became King Karl XII. 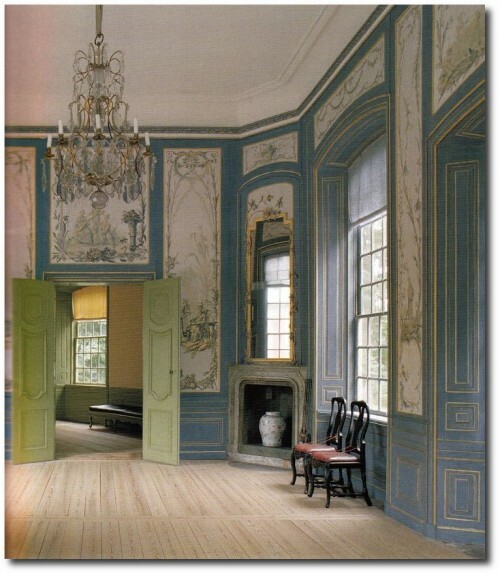 The interior decorations have remained virtually untouched ever since 1782. 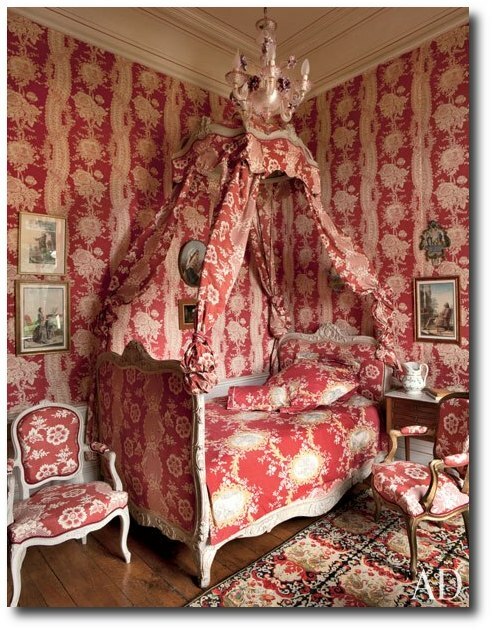 The painted Chinese silken wall-hangings, however, have faded considerably and the bed curtains have twice been replaced, most recently in the 1890s. 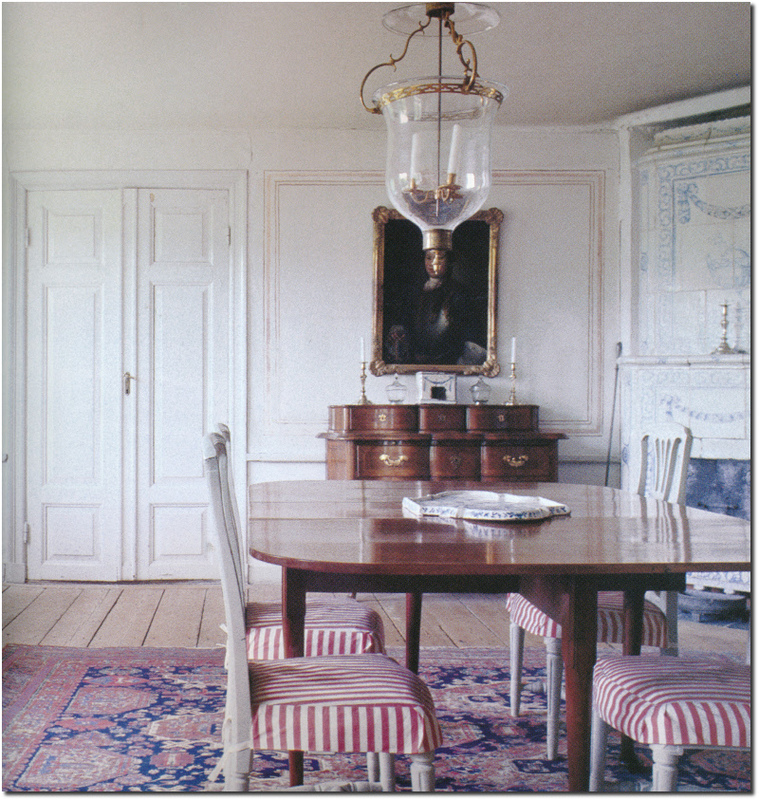 The chest of drawers, made in about 1780, was originally purchased for Sofia Albertina and is typical of its maker, Jonas Hultsten. 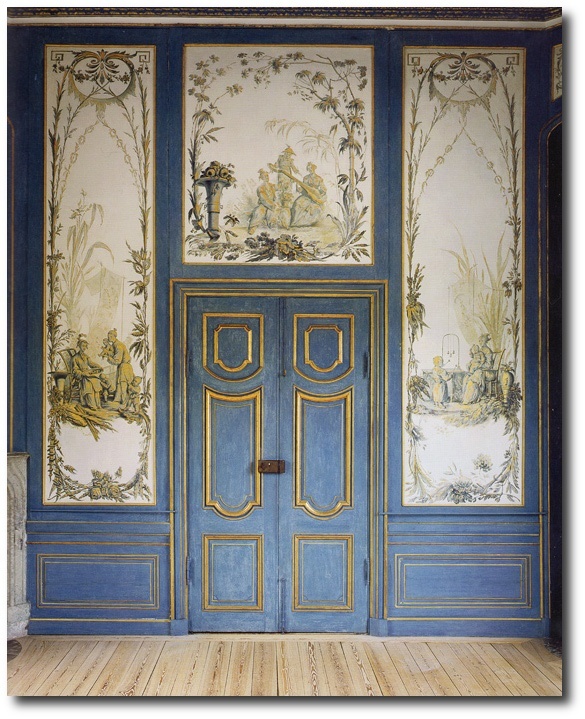 There were no portraits on the walls in Sofia Albertina’s days. Several of those to be seen here now are tapestries modeled on oil paintings. 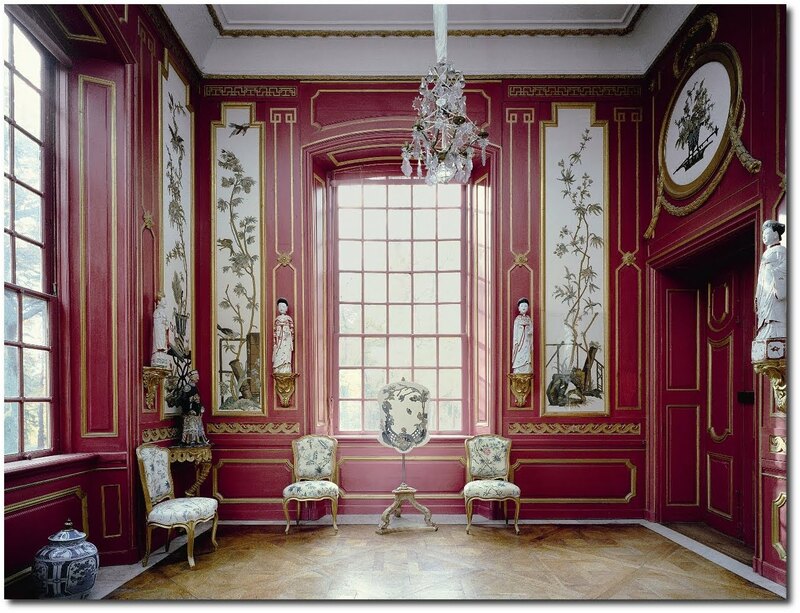 The red room at the Chinese Pavilion of the Drottningholm Palace, Sweden. 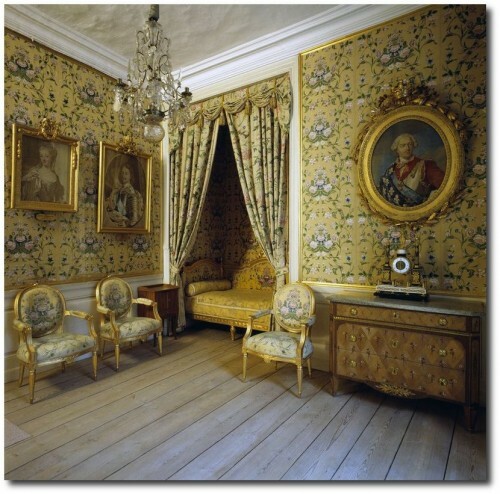 The Drottningholm Palace is the private residence of the Swedish Royal Family. 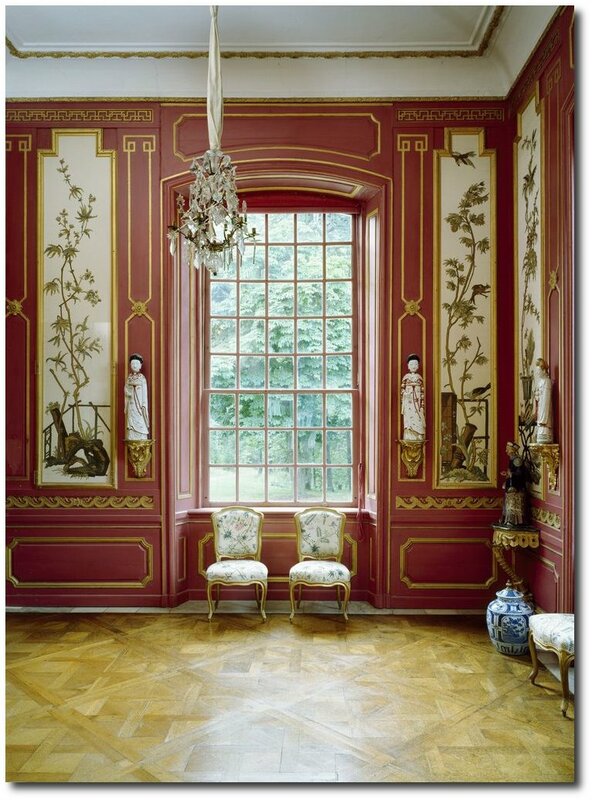 The Chinese Pavilion was built in the middle of the 1700s, a period in European history when chinoiserie was the height of fashion. Today, the pavilion houses one of the finest remaining examples of such an interior. The Farrow & Ball St Antoine wallpapers are based on an 18th century French damask wallpaper originally produced in 1793 at St Antoine. This colourway is part of the F&B Special Edition I collection of contemporary adaptations of Farrow & Ball designs.